In his Topographical Dictionary of Ireland (1837), Samuel Lewis wrote that the ‘noble mansion’ at Newbridge, County Dublin was said to hold ‘several valuable paintings by the old masters, which were collected on the continent by the Rev M. Pilkington, author of the Dictionary of Painters, who was vicar of this parish; the drawing room contains several of the paintings described by him.’ The cleric mentioned here was Matthew Pilkington, born in King’s County (now Offaly) in 1701 and ordained a deacon in the Church of Ireland twenty-two years later. His was likely not a very profound vocation, but a position in the established church offered career advantages of which he intended to take advantage. Initially all went well. In 1725 he married the well-connected Laetitia van Lewen, as diminutive – but also as witty – as her husband, and the couple became friends with the likes of Jonathan Swift and Patrick Delany. Through the former Pilkington secured the position of Chaplain to the London Mayor of London and so moved to the other side of the Irish Sea. However in London he antagonized potential supporters and was imprisoned two years later. On returning to Dublin, he then became estranged from his wife and the couple was eventually and scandalously divorced in 1737: just over a decade later Laetitia Pilkington published her entertaining memoirs, from which her former husband emerges in a poor light. Ultimately he recovered his social position thanks to the patronage of Charles Cobbe, Archbishop of Dublin who offered Pilkington the living of Donabate and Portraine next to Cobbe’s newly completed seat at Newbridge. As mentioned by Lewis, it is believed that Pilkington travelled to mainland Europe to buy paintings for the house and that this in turn would have informed the work by which he is remembered: The Gentleman’s and Connoisseur’s Dictionary of Painters, the first such book published in English. It appeared in 1770, four years before the author’s death. Around 1720 Algernon Coote, sixth Earl of Mountrath agreed to take a lease on a house due to be built at 30 Old Burlington Street, London. Erected over the next few years this property was designed by Richard Boyle, third Earl of Burlington (and also fourth Earl of Cork), together with his protégé the Scottish architect Colen Campbell. In the event, Lord Mountrath never occupied the building, which was demolished in 1935. However, what might be described as its twin can be found in Dublin, at 9 Henrietta Street, which dates from c.1731. Why this similarity of design between the two houses (especially since images of 30 Old Burlington Street were neither engraved nor published)? The original owner of 9 Henrietta Street was one Thomas Carter, an ambitious politician who would serve as Master of the Rolls in Ireland and Secretary of State for Ireland. Known for his opposition to English government interference in the affairs of Ireland, Carter’s great ally in the Dublin parliament was Henry Boyle, future first Earl of Shannon and a cousin of Lord Burlington (whose Irish affairs he managed). Furthermore in 1719 Carter married Mary Claxton, first cousin of Sir Edward Lovett Pearce, to whom the design of 9 Henrietta Street is attributed (in turn, Pearce’s uncle was Thomas Coote of Cootehill, a cousin of Lord Mountrath). It will also be remembered that Pearce was the architect who designed the new parliament building in Dublin. Family connections were as helpful in 18th century Ireland as they are today. Aside from certain details, 9 Henrietta Street follows the design of the Old Burlington Street house both inside and out. The exterior is of five bays and three storeys over basement, of brick other than rusticated rendering on the ground floor (unlike the London property which was all faced in brick). The entrance is through a doorcase with blocked Ionic columns rising to a pediment centred on a massive keystone. Directly above, as with London, is an arched window, flanked by Ionic pilasters. Likewise internally the plan differs little from the London house, notably in the entrance hall which is the finest extant on Henrietta Street (so many of the other staircases were pulled out when buildings were converted into tenements). On entering the property, one sees a screen of Corinthian columns (of marbleized timber) to the right of which is the double-height staircase, taking up a quarter of the entire space. Beneath an elaborate wrought-iron balustrade with mahogany handrail, cantilevered Portland stone stairs climb around three walls to reach the first floor. The walls retain their original plasterwork panelling, beneath a compartmentalised and coffered ceiling. 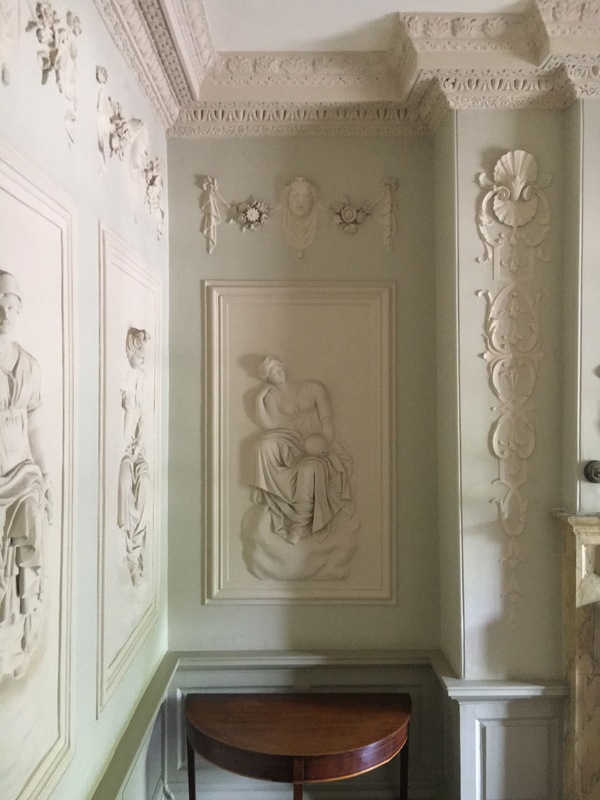 Thanks to its scale and quality of finish, this is one of the most dramatic 18th century interiors in Dublin. 9 Henrietta Street’s other important room is to the rear of the ground floor, which, like the entrance/staircase hall has been little altered (although in line with changing fashion the windows here were lowered c.1800). Once more the walls are plaster panelled and the ceiling compartmentalised. The chimneypiece, of painted wood and marble, features a lion’s head with foliate garlands to either side; above is an aedicule with Corinthian pilasters and a gilded eagle occupying the pediment. The main doorcase, leading to the room in front, is likewise pedimented and flanked by Corinthian columns. Unlike many other houses on Henrietta Street, No.9 had a relatively benign history over the past three centuries, which explains why its appearance has changed so little. Following Thomas Carter’s death in 1763, his two sons lived in the building, after which it was occupied by John, first Viscount O’Neill who was killed by rebel forces during the Battle of Antrim in June 1798. 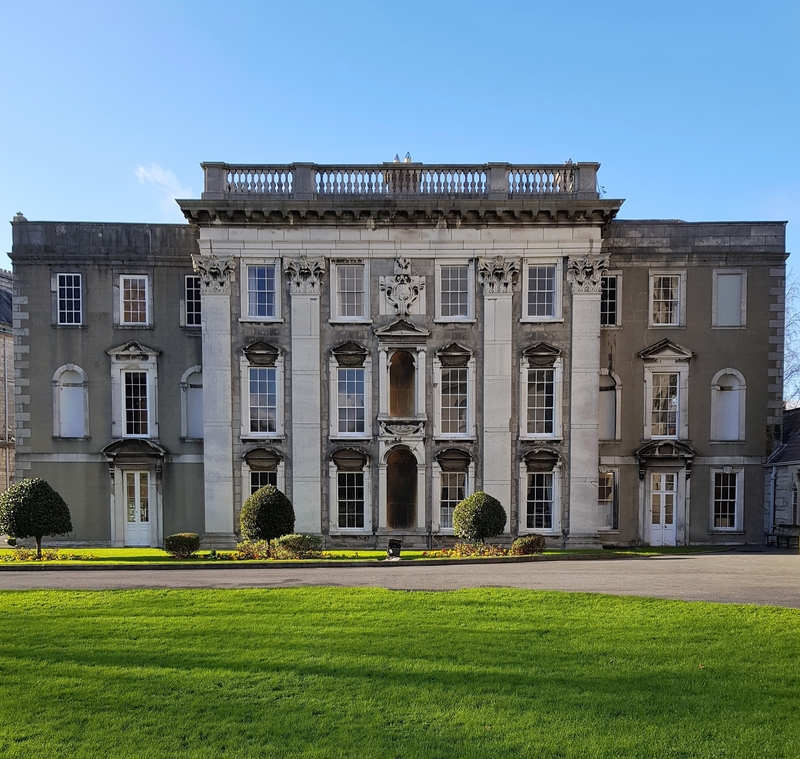 For some four decades in the first half of the 19th century, the house was residence to Arthur Moore, a former member of the Irish parliament (and opponent of the Act of Union), later Judge of the Court of Common Pleas in Ireland. Following his death it was used as the Queens Inns Barristers’ Chambers. At the start of the last century the building was acquired by the Daughters of Charity of St Vincent de Paul who also owned the neighbouring 10 Henrietta Street (see Shedding Light on a Subject, March 20th 2017). It remains in their care to the present time. 9 Henrietta Street was restored some twenty years ago by Paul Arnold Architects and is now used as a resource and education centre for the local community. The County Kildare institution long known as Maynooth Seminary was established by act of the Irish Parliament in June 1795 as The Royal College of St Patrick to provide ‘for the better education of persons professing the popish or Roman Catholic religion.’ Curiously it would be eighty years before building work began on the college’s present chapel. In the early 1850s the English champion of the Gothic Revival and convert to Catholicism Augustus Welby Pugin had produced designs for the quadrangle called St Mary’s Square. His plans included a chapel but owing to Pugin’s death in 1852 and a shortage of funds, this part of the project was not initiated. Only in October 1875 was the foundation stone laid, the architect now being J.J. McCarthy, often popularly described as ‘the Irish Pugin.’ By 1880 expenditure on the work had reached £26,242 and when McCarthy died two years later just the basic structure had been completed: a report issued in the middle of the 1880s appealed for financial aid so that the ‘useless empty shell’ could be finished as ‘a splendid, fully furnished collegiate chapel’. In 1887 seven Catholic architects were invited to tender for the job of designing the interior, William Hague being selected. The building was consecrated and opened for worship by Cardinal Michael Logue in June 1891 but still the work went on. Hague designed the tower and spire in 1895 but, as with his predecessors, he did not live to see the work here reach conclusion; rising 273 feet, it is the tallest such built structure in Leinster. Inside, the Lady Chapel at the east end was decorated and furnished by architect G.C. Ashlin in 1908–11; Ashlin was also responsible for the alabaster high altar and reredos. At 222 feet, Maynooth is the longest church choir in the world and certainly the most elaborately decorated in Ireland. Every surface carries ornament, all sharing the same theme of ‘Laus Deo’ (Praise God). The marble mosaic floor, for example, carries lines inspired by Psalms 112 and 46 opening with the line ‘Laudate pueri Dominum’ (Praise the Lord, young men). The use of the fleur-de-lis on the floor is intended to evoke not just the Trinity (in the same way that the shamrock is supposed to do) but also the links between Ireland and France during the worst times of the Penal era. Meanwhile the ceiling is covered in canvas featuring a vast heavenly procession of figures leading up to the main altar, predominantly angels and saints, many of the latter being associated with Ireland and the early Christian church here. Each figure is enclosed within a medallion again bearing lines from sacred texts. The design was by the English religious artist and decorator Nathaniel Westlake but the work executed by a little-known artist based in Dublin called Robert Mannix. The walls above the choir stalls are life-size representations of the Stations of the Cross: like the ceiling they are in oil on canvas, and were designed and supplied by Westlake. More colour is provided in the interior by stained glass installed in the 1890s and for which three companies were responsible: that owned by the aforementioned Westlake; Cox, Buckley & Sons; and the Munich-based firm of Mayer & Co, which was then much patronized by Catholic and Anglican churches alike throughout Ireland. The glass in the chapel nave is devoted to representing scenes from the life of Christ while at the west end of the building a large rose window inspired by that in the Cathedral of Notre Dame at Reims is devoted to celebrating Christ the King surrounded by sundry saints, apostles and evangelists. In the main body of the chapel, the space between the top of the choir stalls and the bottom of the windows is filled with a string course of Caen stone carved with animals and birds to demonstrate that even members of the animal kingdom sing the praises of their creator. The corbels at this level represent angels presenting various instruments used in church services by clerics, the two closest to the high altar holding a mitre and crozier (as used by bishops). Finally there are the stalls, all 454 of them carved in oak by a Dublin firm, Connollys of Dominick Street. The finial in the back row of each section supports the figure of a saint while those on the lower levels represent a different plant or tree, again to demonstrate the variety of divine creation. Whatever one’s faith, or even if one has none, the decorative scheme of Maynooth College Chapel cannot fail to impress. It has a rigour and entirety of both vision and execution rarely found in Irish Catholic churches. Furthermore the interior has escaped despoliation by either unnecessary post-Vatican II reordering or by the imposition of some later cleric’s ill-judged aesthetic notions (cf. the so-called ‘renovations’ of the cathedrals in both Killarney and Monaghan). As a result it remains not just the largest chapel in Ireland but also one of the country’s finest Roman Catholic buildings. Looking down an enfilade of rooms on the ground floor of the 1903 Milltown Wing at the National Gallery, Dublin. This portion of the building was designed by Sir Thomas Newenham Deane (following his death in 1899, its completion was overseen by his son Sir Thomas Manly Deane). A notable decorative feature is the doorcases carved in walnut by the Italian woodworker Carlo Cambi. The picture below shows the equivalent sequence of rooms on the first floor which, like much of the rest of the gallery, have been closed to the public for the past six years: once fully re-hung with pictures from the collection, they are due to reopen in mid-June.